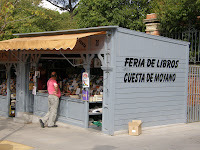 This unique open air book market is located along the Cuesta de Moyano. Named after Claudia Moyano, the politician who reformed the Spanish education system in the mid 1800s, it has been a favorite with locals for generations. 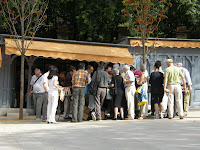 Wooden stalls, piled high with old and rare books, sit along the Cuesto de Moyano from the Atocha end of the Paseo del Prado heading uphill to the southwestern corner of the Retiro Park. 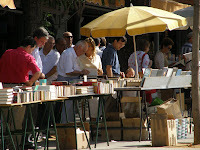 The market is open daily from 10 am to 7 pm but Sunday morning is the liveliest time to visit. 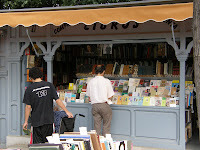 Meant to ask ... do you have a street address for 'J&Js' bookshop/coffee bar that you mentioned in an earlier post? I'm due in Madrid in a fortnight, and it sounds an interesting place to visit. pS are you off to a Pueblo Ingles week??? What fun for me to keep up with your traveling like this while you're away. I'm going to let Alzheimer's Notes readers know where they can follow your travels. Your posts are coming up just fine on the blog. Thanks for all your work organizing them before you left. No ... the 'other one' .... Vaughantown ... I did Pueblo Inglés at Valdelavilla last year, and 'Englishtown' (before the split) at La Alberca in 2005.